Description: This is a very well known plant due to its ability to cause mild to severe skin reactions. It is often recognized by it characteristic 'leaves of three', even though it is only one of many plants with such a feature. 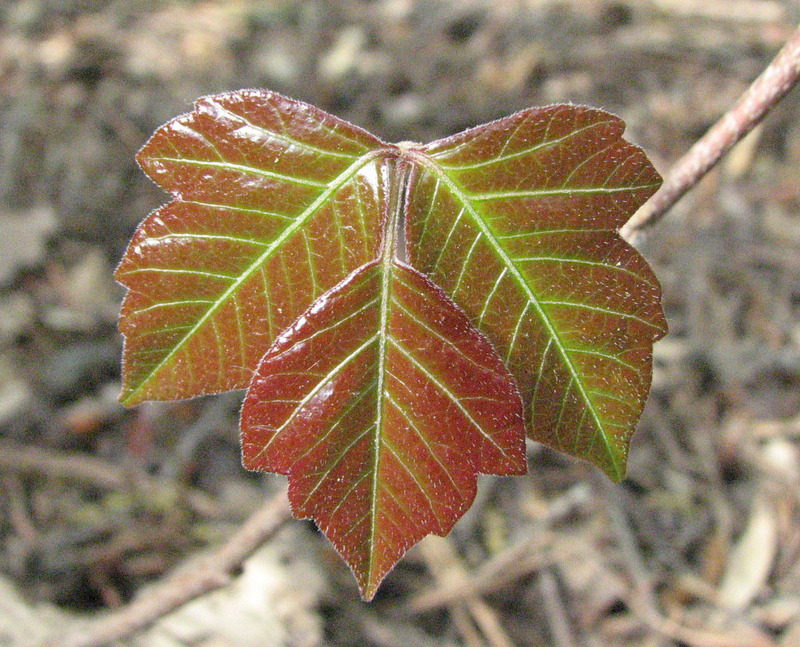 Its leaf shapes may vary, but they tend to have a distinctive shine. This plant can take many different forms, including a woody climbing vine with dense, hairy-looking aerial rootlets. Medicinal: None known. But it has been anecdotally reported that this plant may be used as a catalyst in other more complex plant medicine preperations. Nevertheless, experimentation is discouraged for obvious reasons. Poisonous: Avoid contact with this plant as it is probably the most common cause of contact dermatitis due to the presence of urushiol, a non-volatile oil. Also beware of accidentally burning sections of the woody vine with firewood, as the toxic oils can become airborn in the smoke and enter the lungs. In this way it is possible to develop an internal reaction to posison ivy, which can be very dangerous. See Jewelweed as a possible antidote. Other Notes: Poison ivy was considered by many primitive peoples the chief of the warrior tribe of plants. This group also included plants such as the stinging nettles and thorn bearing briars. These plants all tend to grow quickly in transitional or disturbed areas and served to keep animals (especially humans) from entering such areas, thus allowing a healthy plant community to establish itself. Poison ivy was accorded the title of chief because of its interesting ability to appear in many different forms, depending on the situation. It may appear as a low growing plant, a shrub or even a climbing vine.